Information on this shipping info page applies to all orders that require shipping via our online stores or any other channels. Your shipping rate will be automatically calculated on check-out, after you have provided us with your shipping address, postal code and country. the OBJECT ROOM asks that you ensure you have provided the correct address, postal code and country, as in the situation that an incorrect address and/or postal code has been entered, your order may be delayed, and we may need to contact you for clarification before your order can be sent. All purchases made through our online stores and require to be shipped, will be processed by the following business day at the latest, providing that payment has been received by us. If your order is made on a Saturday, Sunday or a public holiday, your order may not be despatched / collected by our shipping company until the next business day, depending on the shipping method that you have chosen. We will notify you via email or SMS once the order is ready for despatch. A tracking number and date of despatch will be provided in this email or SMS. All shipments will include tracking and insurance. the OBJECT ROOM do not have permission to give any special delivery instructions to shipping companies (“Leave at lobby”, for example). If you wish, you may contact the shipping company directly once you have received your tracking number from us as most companies will only allow the recipient to provide permission for such requests. Please note that your order’s shipment is insured up to the point of final delivery at the provided shipping address (The Final Delivery Point). the OBJECT ROOM is not responsible if your shipment is stolen, lost or damaged after the final delivery point. If you have requested a special delivery instruction with the shipping company (“Leave at lobby”, for example), the insurance will cease when the order delivered at the lobby. The order is not insured during the time storing at lobby, regardless of whether or not the lobby is attended or secured. FREE SHIPPING with Kerry Express for all orders with value ฿2500.00 THB or above. 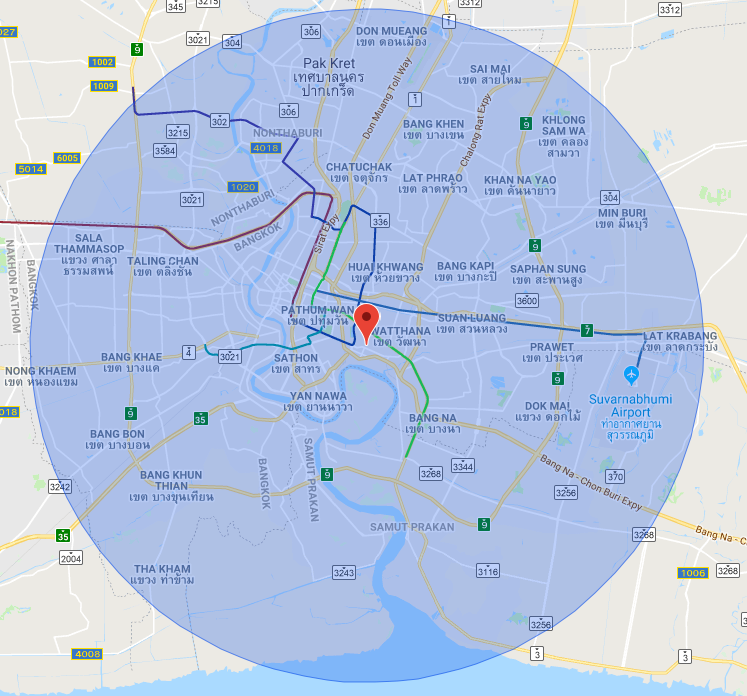 the OBJECT ROOM uses Kerry Express for order shipments to all area within Thailand, as well as LalaMove for order shipments to Bangkok, Nonthaburi and Samut Prakan areas that are within 30 km from our store. See coverage area map here. You may refer to the charts below for information on shipping fee and targeted time of delivery within Thailand. Please note that targeted delivery time is an estimated, non-guaranteed time of delivery once despatched, and does not include any time for processing of your fully paid order. * Delivery to rural / remote addresses may take extra working days to the standard targeted delivery time. ** Available daily between 11am to 8pm. ^ Only available for Bangkok, Nonthaburi and Samut Prakan areas that are within 30 km from our store. See coverage map here. the OBJECT ROOM provide a pickup in-store option for your convenience. You may pick up your own order personally or by designating an alternate pickup person, including your own messenger. If the person who will be picking up the order is someone other than the person who made the order, please notify us of this before pickup is made. Please note that if you are using your own messenger for pickup, you must notify us before the pickup. Without your notice in advance, we are not able to release your order to anyone other than the person who made the order. Once your order has been picked up, the OBJECT ROOM shall not be held responsible if your order is stolen, lost or damaged. Once your order is ready for pickup, we will notify you by email or SMS if you provided us with your mobile number. Usually 1 - 2 hours during our opening hours. When picking up your order in-store, you or your alternate pickup person must show a valid government-issued photo ID, for example Thai ID, driver licence or passport. Orders will be kept in-store for 7 days after your order has been placed and you have received the Order Confirmation email. If your order has not been picked up within 7 days, we will return all objects back to stock and the total amount that you paid will become an in-store credit which is valid for 14 days. Should you require the order to be shipped instead, standard shipping rules apply. If your order is subject to shipping fee, you are required to make such payment before your order despatched. the OBJECT ROOM uses DHL Express for shipment of all international online orders sent to selected worldwide residential, business and rural addresses. Please note that DHL Express do not deliver to Post Box or Post Bag addresses. Due to security reasons, we do not ship to freight forwarding companies, nor to any address deemed to be a re-direct service address. Should you require delivery to any country not listed, please contact us before purchasing online. The shipping fee will be based on your shipment’s actual volumetric weight. Due to the complexity of this shipping fee calculation, we will need to process the shipping fee on a case by case basis, and your order will be processed manually. Please contact us and we will be more than happy to arrange this for you. You may refer to the charts below for information on shipping fee and targeted time of delivery outside of Thailand. Please note that targeted delivery time is an estimated, non-guaranteed time of delivery once despatched, and does not include any time for processing of your fully paid order. * Delivery to non-major cities or towns and rural or remote addresses may take extra working days to the standard targeted delivery time. the OBJECT ROOM ships internationally outside of Thailand with Incoterms DAP (Delivered at Place) with Billing Term DTU (Duties and Taxes Unpaid), which means Buyer / Recipient pays the customs clearance charges, storage charges, customs duties and import taxes while the Seller / Sender pays for transportation and insurance costs. the OBJECT ROOM is not responsible for any import tax, duties, custom clearance fees, storage fees or any other additional expenses that may occur on delivery to addresses outside of Thailand. Your shipment may be subject to custom clearance or other related procedures, which can cause delays beyond the targeted delivery time. Some countries may have restrictions / requirements on importing certain items, which may include additional procedures and costs. the OBJECT ROOM asks that you ensure such restrictions / requirements before ordering from our websites. the OBJECT ROOM is not responsible for any costs that may occur for these extra procedures to fulfil such restrictions / requirements. Should you have any concern or questions in regard to this, please contact your local customs department to get more information.